When adding a property on a node sometimes there is a autosuggest list with options (see screenshot). The list is filtered when you start typing. But if the property name has a different case than what you type, the suggestion is filtered out. 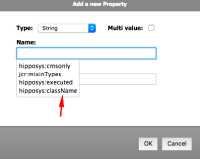 In case of the screenshot example: if you type "name" in the field the option hipposys:className is filtered out of the list, but it would be more handy if it would stay. This autosuggest feature exist in the add property and add node dialogs.